The semi-annual sale of Russian art works in London last week produced signs of stable demand without pessimism for the future. Compared to the estimated valuations in the auction house catalogues, unusually high prices were realized in the bidding for objets d’art, such as miniatures of 18th century Russian court notables; porcelain vases, plates and kovshs (ladles); and icons. Sotheby’s, MacDougall’s, Christie’s and Bonham’s are the four London houses holding auctions of Russian art works every June and November. Altogether, the four reported sales last week totalling £34.5 million, counting both paintings and objets d’art. This was up 12% from the June round of sales; down 30% on the result of December 2017; but well up on December 2016. 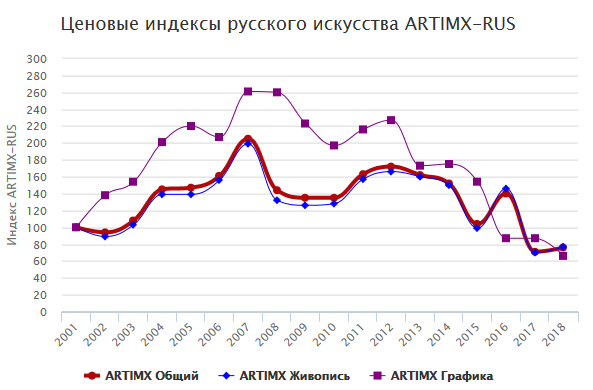 The Russian market trend, as indexed for pictures and graphics, but not counting objets d’art, jewellery and icons, indicates there was a bottoming-out last year, with signs of improvement this year. In paintings last week Sotheby’s kept its lead over its London competitors with £13.4 million in proceeds, followed by MacDougall’s with £6.3 million. MacDougall’s does not sell art objects. Sotheby’s sold those for £5.4 million. Christie’s combined its paintings and objects for a total of £7.2 million; and Bonham’s, which also aggregates sales of paintings and objects, managed to collect £2.2 million, trailing well behind the rival houses. The leading painting was Konstantin Makovsky’s 1900 academic genre work, “Blind Man’s Buff” (pictured below left). Estimated in the range of £2 million to £3 million, Sotheby’s knocked it down for £4,287,400. For the first time several objects hit records in Sotheby’s auction. This silver and cloisonné enamel kovsh (below, right) was estimated at £50,000 and sold for £490,000. In Sotheby’s sale of objects, miniatures of Catherine the Great and the aristocrats Grigory Orlov (lead image, centre), Alexei Vasiliev (left), and Alexei Kurakin (right) were sold at five to ten times their estimated value. A gilded and enamelled icon of the Trinity, executed in St. Petersburg by the Grachev brothers in about 1890, jumped from an estimate of £30,000 to the hammer price of £346,000. The political situation surrounding Russian Art Week in London always influences the way money is spent. This season there were almost no Soviet Realist works on offer, as there had been a year ago. Sotheby’s offered a painting by the 19th century Russian Ivan Aivazovsky of “Winter in Ukraine” (1874), but it failed to find a buyer in the estimated range of £18,000 to £25,000. His “Evening in Crimea” (1895), by contrast, was estimated between £80,000 and £120,000; it sold for £156,250.